in slumber in the heart of the of the Dark Mountain. looked at one another, "The legend is true!" One cried out. "If it is so then we must warn the others!" The oldest of them said seeming to keep his composure rather well. "Quick let us depart immediately." With that all three turned to the door and, broke into a sprint making there through the dark Garheim evening. 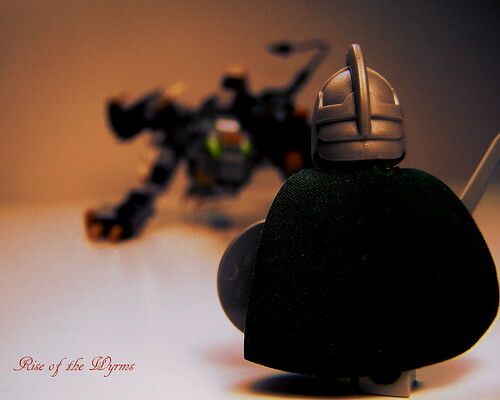 Rise of the Wyrm #3 by Chief Paladin of Lenfald., on Flickr. 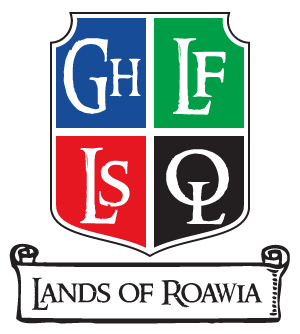 Soon word would spread in the far North and, perhaps even across all the land of Roawia. The dragons were awaking. The Rise of the Wyrms was Nigh! 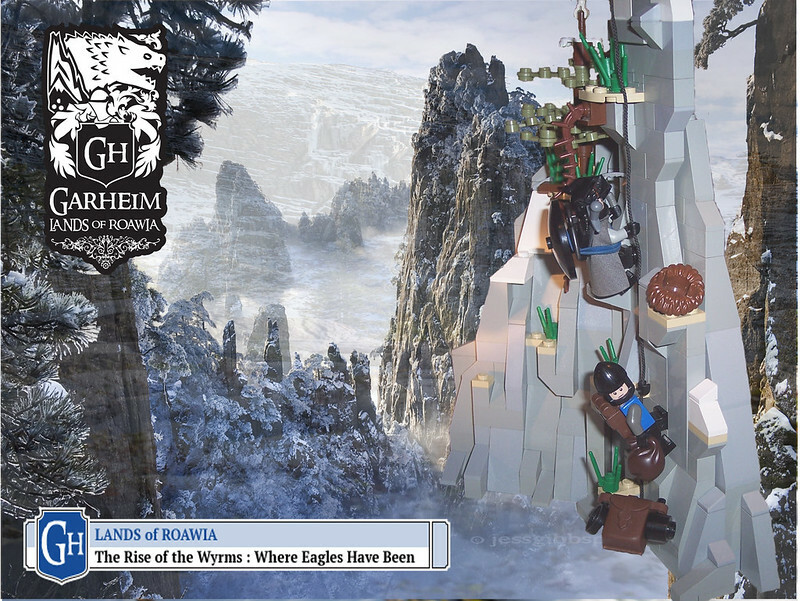 These brave members of the LOR have chosen to challenge the rising Wyrms. Will you join us...? Check out our awesome banner on Flickr as well! "FIRE!!!" The Drake's Bane bellowed once more as he rolled behind the shieldwall of Valeguard knights and Dunharris men-at-arms, landing in a crouch and brandishing his longspear at the dragon. "Fire indeed," thought Sir Caedric, ducking behind the protection of his great shield as the Garhim ballista launched another massive arrow towards their enemy with a resounding CRACK!, the great wooden arms of the war machine snapping forwards. It met its mark in the dragon's flank - or it would have, but the beast writhed and wriggled like a worm that has seen a hook, dodging this way and that, snapping at the Northmen that surrounded it and belching withering plumes of fire from its jagged maw. "This beast has no short supply of it. Many men would flee in terror at the mere sound of this creature's roar but the Drake's Bane certainly lives up to his name." 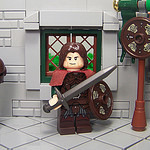 Sir Ian was a few years younger than Caedric, being born when the latter was a still a squire and a ward in Hallfrost, and it was clear he hadn't seen much battle but he led his men-at-arms with a determination and a fearlessness that only a Garhim could boast. Finding the Echowyrm had proved easy enough - it had been rampaging through the north of Orevale Hold, devouring livestock and farmers alike and burning entire villages to ash. 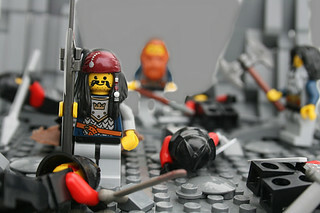 The combined forces of the Valeguard and Dunharris' men-at-arms had peppered the beast with crowssbow fire and had blared trumpets to lure it to the ground, then harrying it with longspears, swords, and maces with coordinated attack patterns designed to distract and confuse the dragon in an attempt to prevent casualties. They had lost more than a few good men before the beast decided that the humans were too dangerous and fled, too tired and its wings too torn and tattered to fly. 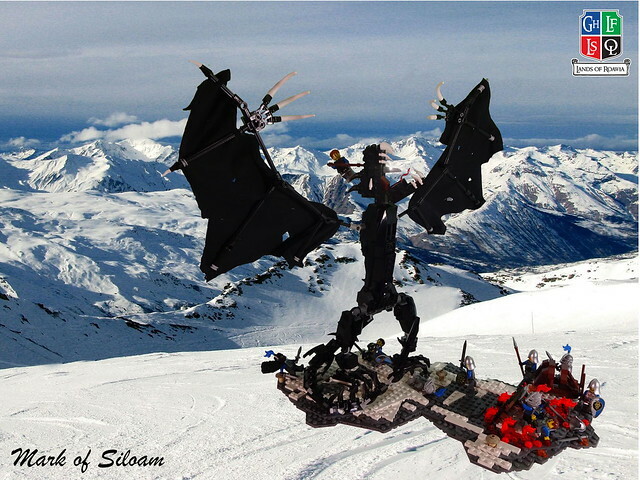 They pursued their quarry to the ruins of an abandoned fort at the base of steep cliffs where the dragon turned angrily on its pursuers, enraged that it could no longer fly up to wherever the entrance to its caverns was. The Echowyrm's movements became more erratic and even more ferocious, if such can be said about a dragon, roaring and lashing its tail left and right. Caedric saw his opportunity in the form of a diversion as the dragon dodged another ballista round and he quickly climbed the piles of slag and ruin until he crested what remained of the fort's outer wall, bringing himself level with the top of the wyrm's head. With a roar as ferocious as those of the dragon, Caedric ran and leaped out into empty air, parting the flames of another outburst with his great shield, brandishing the heavy spiked ball of his morning star in a massive arc as he soared towards the Echowyrms gaping maw. 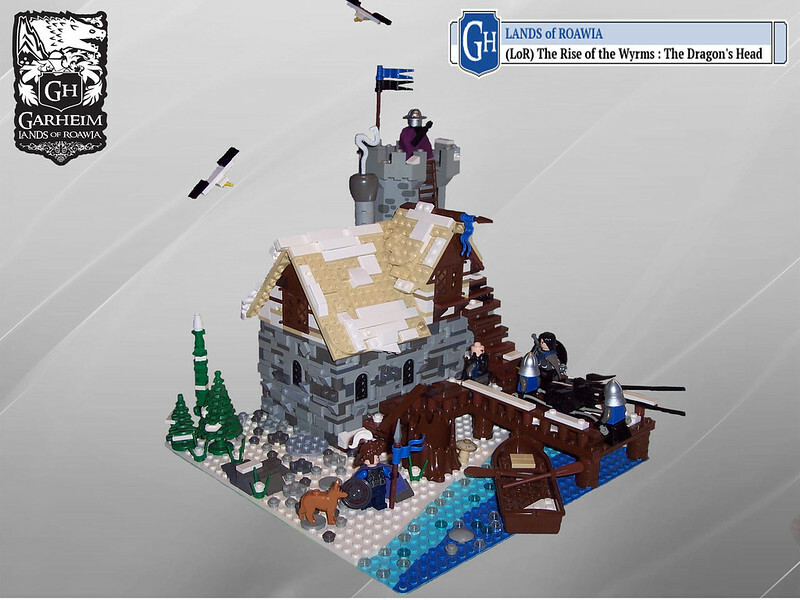 My first freebuild for May, part three of my collab with SpearralSquid, and (I may be jumping the gun a bit here but I just can't wait) my first installment in the Rise of the Wyrms collab! 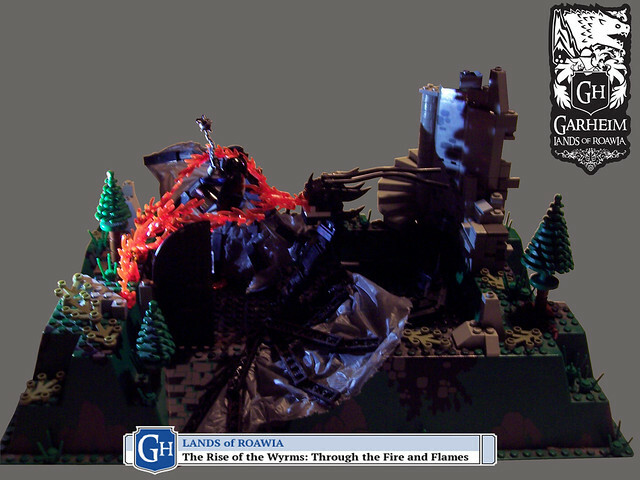 See Brickninja's build for his side of the story. "You've done it..." the Garhim from Dunharris said with a mixture of astonishment and relief. "You've slain the Wyrm." "Aye," Sir Caedric replied with a grin, pulling his gleaming sword from the neck of the dragon as it lay dead and smoking at his feet. "With your help, Ian. Yours and that of your men." "And my ballista," Sir Ian smirked. Caedric laughed. "Just so. I can't thank you enough. I'm afraid there won't be any feasts until the nest is found, however. Care to join me on a little climb?" "Eesh," Ian said gazing upwards at the mountains behind them, its snowy cliffs towering over the ruined fort dotted with small evergreens and sparse vegetation. "As fun as that sounds, I've got to get back to Dunharris. But the offer stands - next you're up my way, stop on by." "I'll be sure to darken your doorway one of these days." "I hope so. Wind at your back, brother," Sir Ian smiled before turning north and leading his men-at-arms down the old road that led out of the foothills that marked the end of the Pinewoods of Orevale and into the Great Driftplains of Garheim. "Courage, Honor, Loyalty. For Garheim, brother." "Is it much further, m'lord?" "Not far," Layton Connors replied, urging the young ranger from below. "But what's your rush, lad? Ye eager to be roasted by some wee dragons?" "Surely... surely the little ones can't breathe fire, too... can they, sir?" the boy asked, clearly still shaken from the battle with the dragon. "Who's to say? But the mother could - and you bet the male's waiting in those caverns for us." "Less talking, more climbing, Layton," came a stern voice from above the young ranger. "Oh, come off it, Caedric. Yeh're no fun." "The time for fun is not yet at hand, Sir Connors, and I'll not have you frightening my recruits," the Captain said with a grin, tossing a handfull of snow down past the freckled boy where it landed on the plumed helmet of the big knight with a fwump! "I'm not scared, m'lord. Honest. Just concerned, is all. New tunic, and what have you... hate to see such nice embroidery go to waste, is all. Really." "We're jus' messing with you, Ronny," Sir Layton relented from below, pulling himself hand over hand up the thick hempen rope. "Just a little hazing, is all - what with you being a new recruit, Fledgeling." "That old knight has the right of it, though, Ronald," the Captain of the Valeguard called down. "The caverns aren't far, now." "And neither are the dragons..." he thought. My contribution to the Rise of the Wyrm collaboration! Mark went up north to visit the guy from the last story but was ambushed by a dragon with a cool name. They are outnumbered and unprepared for war but Mark epically slays the beast as can be expected. Mark is caught under the dragon’s wing with no way out. Pretty unepic, huh? The long story is better... Check it out on flickr! Courage! Honor! Loyalty! For Garheim! "You should not have goaded him so much, Layton," Sir Caedric Moore chided, looking between his shieldman Layton Connors and the Knight Rangers' newest recruit, Ronald son of Roald. 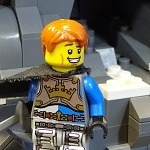 Ronald, whom the other rangers called Fledge, had taken the big shieldman's teasing too seriously and felt his bravery to be in question, being the first of their little party to unload his bags and lead the expedition into the cave, a blazing torch held aloft in front of him and a determined expression on his face. The other members of the party moved forward more cautiously - even testily - swords and spears clenched tightly in their fists, ready to face whatever threat the caverns posed. It had been all but proven that the Echowyrm had made its nest here - bones of both livestock and farmers cluttered the rough floor of the cave - and it was likely that the dragon's mate and nestlings were nearby. "He tries too hard to prove himself." "Perhaps he will, Caedric," the big knight responded, rolling his shoulders after the tough climb up the cliff face. "I know ye have faith in the lad - the same as I do. He's Roald's son, after all." 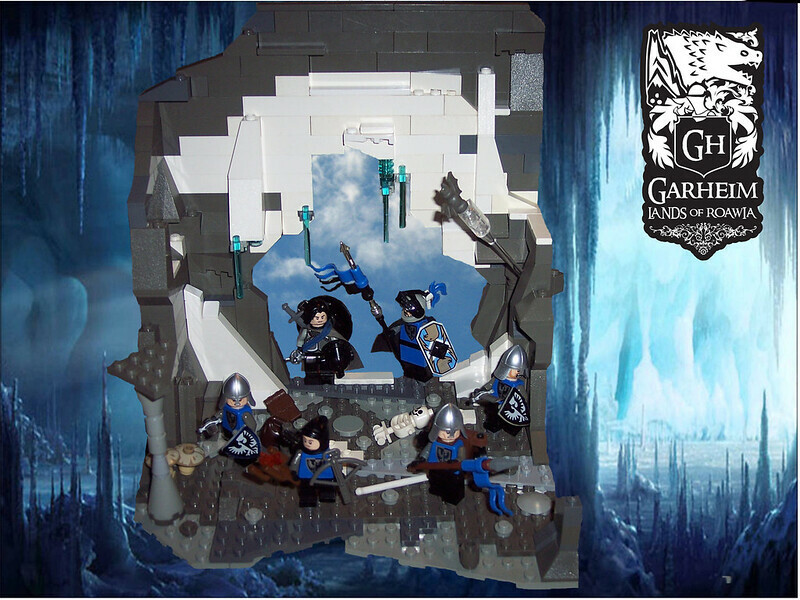 Sir Layton propped his spear against the icy wall of the cavern mouth and wrung his hands together characteristically. "He may prove his mettle yet." "Aye, faith I have," Caedric sighed, following the party of rangers into the spreading vastness of the cavern. "But mettle and lineage might not be enough to compensate for inexperience. We are dealing with dragons, Layton." "I don't mean to argue with you, my liege," Sir Connors replied, wiping crusted ice from his large grey mustache, "but the boy has got potential. You know I handpicked him for the Vigilants, originally; he's a natural with a blade, if a bit clumsy with his footwork, and his foresight when it comes to blocking with a shield is commendable. But he also showed balance and finesse, easily mastering the Rangers' trials and putting him on the fast track to becoming a member of the Wulfguard one day. That is why you chose him for this quest, is it not?" ...And was answered by a deeper rumble from further in the darkness followed by an echoing roar and the tell-tale sound of leathern wings beating the air. "Well, Boy-o," Connors smiled ruefully, clapping his captain on the back and grabbing his spear from its resting place. "Looks like you've done it now." The cavern trembled - and so did some of the men - as a deep resounding roar echoed from further in the cave. The dozen or so Valeguard Rangers that Sir Caedric had chosen for this quest readied their weapons, tossing bags and packs to the rough bone-strewn floor and turning this way and that as they gazed into the darkness. "Well, Boy-o - looks like you've done it now," the big knight jested ruefully, clapping his captain on the back and grabbing his spear from its resting place against the icy wall of the cavern mouth. A few moments passed, and the echoes of the dragon's roar subsided. Sir Caedric Moore - Captain of the Valeguard - raised his hand to signal that the men hold positions and then gestured for the party to keep quiet. He nodded his head - first left and then right - at two of the party's younger rangers and beckoned them come forth silently. "Dean, Ronald..." the Captain said in a low voice, looking each of the men in the eyes as he did. "You two will take flank - Dean, on the left; Ronald, you've got the right side. I want you to maintain a slight lead over the rest of the party, but keep to the shadows and move slowly; use what cover the cavern provides." With a slight wave of his hand, he gestured for the two to head forward, but then called them back suddenly with a short, loud whisper. "No torches. We want his eyes on us; not you two." The young men nodded and slunk off into the shadows of the icy cave. The rest of the party awaited their captain's command with weapons drawn, black cloth soaked in some flame-retardant oil - the Garhims often used it for sails - wound about their shoulders and around their heads. 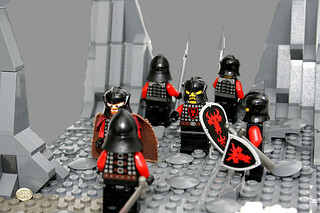 Sir Caedric motioned, and the party rose as one, those with shields moving to the front and the sides as the rest fell in behind their captain and his aging shieldman, Sir Layton Connors, who held his shield aloft and his long spear outstretched, awaiting any danger that might surprise them from the darkness. Step by step, the rangers moved slowly forward through the cavern - and down the path went; down into the heart of the mountain - the only sounds accompanying them being the soft tread of cloth-wrapped boots and the dripping of water from the innumerable stalactites above where they puddled on the floor or landed on similar spires of rock beneath them; Caedric remembered they had been called "stalagmites" in one of the books he'd read in the library, but many of the men called them "dragons' teeth". Eventually, the sound changed to one of water dripping onto water and the cave walls to either side suddenly stretched away into blackness as the party came upon a vast, subterranean lake. Caedric motioned for the party to hold and at that he struck a match and lit his torch, throwing light and shadows across the cave and illuminating the ground around them - which was littered with bones and eggshells. They were standing in the creature's nest. No sooner had the torch been lit than the air was rent by another roar - this one close-by and deafening - and the party was buffeted by wind as a great black shape detached itself from the ceiling of the cave, landing amidst the group on the edge of the lake. The male was big - slimmer than the female and maybe a bit smaller overall - but still huge; massive, compared to anything most men or even most Garhims had dealt with. These were knights of the Valeguard, and every one among them had either been there when Orevale was reclaimed and the female Echowyrm first appeared to gorge herself on the dead and dying or had been a part of the battle with her at the feet of the mountains a week's time ago. They showed no fear, each sparking a match and igniting their own torches that guttered and spun in the wind that was the dragon's breath. It sounded like a winter's storm that blows down hard and cruel from the mountains, yet the heat of it was enough to cause a grown man to swoon and the stench was sickening - overpowering at this close range. The dragon reeled backwards at the sudden burst of light in the darkness and roared once more, this time answered by a chorus of other cries from the dark ceiling of the cave. Caedric craned his head upwards, wary of taking his eyes off of the dragon, and saw the source of the cries: the dragon's young - dozens of them - hanging from the ceiling or clinging to the walls of the cavern like great bats. A pall of smoke hung around them and here and there a small blast of fire erupted. "SHIELDS!!!" Caedric yelled, dropping his torch and pulling the great shield from his back. The big male mirrored his offspring, unleashing a torrent of fire on the party of Rangers in an attempt to scatter them or obliterate them entirely, but the party held strong, shields held aloft in front of them, warding off a literal inferno. The moment that the dragon ceased the torrent, the captain shouted, "FIRE!!!" as those who had been crouching behind their comrades rose and unleashed a barrage of bolts from their crossbows. Many found their mark in the wings or the softer flesh of the dragon's neck, but most glanced harmlessly off of its thick scales as it roared once more in frustration. Caedric knew, however, that there was no time to waste, gesturing to his men and shouting, "LANCES!!! as those who had waited on the sides now lowered their shields and charged the beast. "ATTACK!!! DRAW YOUR SWORDS!!! THE DRAGON DIES THIS DAY!!!" Dean couldn't believe his eyes - dozens of dragons lined the ceiling of the cavern, writhing and screeching like demons from a nightmare. And there, across the lake, the big male tore into the party of rangers - likely killing them all, he thought - and here he sat, motionless behind a stalagmite, gripped by fear. He had seen many things in his service to the Valeguard - even leading the charge against the female Echowyrm a week prior - but the sight of so many dragons and the stench of their filth overpowered him. And so he remained hidden, and he wept, awaiting a death he felt would be imminent and terrible. 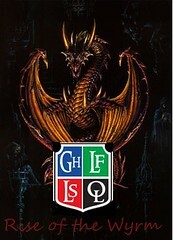 With a mighty yell, Caedric spun and threw his great shield at the dragon, smacking it cleanly across the muzzle. The spiked ball-and-chain of his morning star was lost - strewn somewhere among the bones and bodies of the dead and dying - and he needed something to provide a blunt impact to stun the dragon as he closed the distance. His broadsword would do him no good, now, and he sheathed it, grabbing his shieldman's greatsword as it was tossed to him and charging headlong at the thrashing monstrosity. The dragon recovered from the impact, fury flashing in its eyes, and locked its sights on the man in shining armor running towards it. Brandishing the gleaming Zweihander in a deadly arc, Caedric dodged the lunge he predicted would come and sliced the dragon's neck clean through, sending its head spinning with the force of the blow. Brandishing the gleaming Zweihander in a deadly arc, Caedric dodged the lunge he predicted would come and sliced the dragon's neck clean through, sending its head spinning with the force of the blow. A great cry erupted as the beast was slain - one of joy from the Rangers who accompanied the Commander of the Valeguard and another of rage from above. 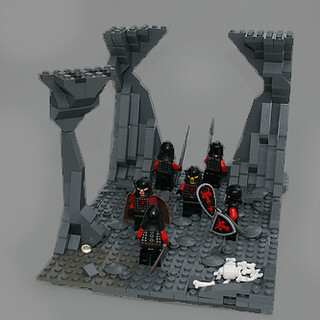 With the Echowyrm dead, the men turned their eyes upwards once more to the ceiling of the cave where dozens of the dragon's young still clung to the rough surface between the innumerable stalactites; judging by their renewed blasts of fire and the increased intensity of their cries, they were none too pleased at the death of the dragons who sired them. "ARCHERS!!!" Caedric yelled to his men as he unslung his own crossbow from his back and loaded a quarrel, training his aim at the young dragons above. "FIRE!!!" the Commander bellowed as he fired his crossbow and the Valeguard followed suit, unleashing a barrage of bolts at the ceiling of the cave. Many found their mark, sending the young dragons screeching and plummeting to the surface of the dark lake below where they landed amidst plumes of water and gouts of fire, writhing as they drowned. 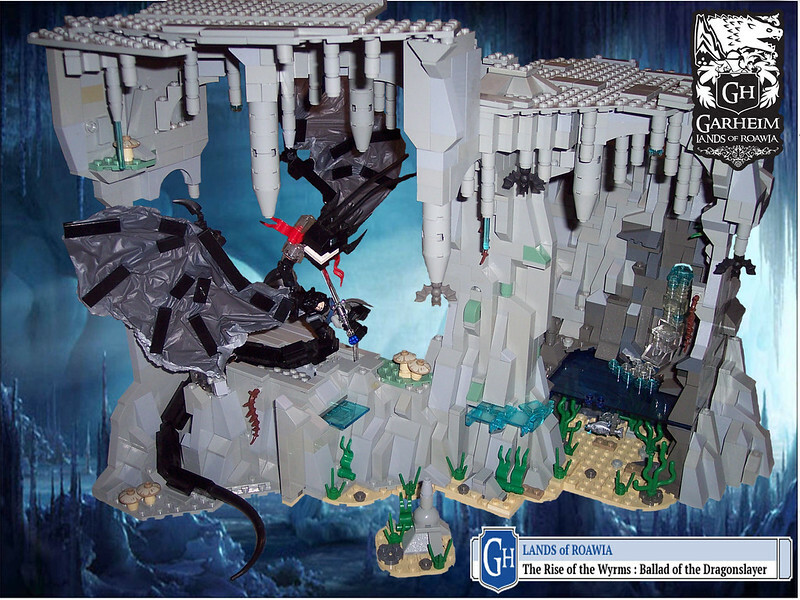 Other shots missed or went wide, clattering against the rough ceiling and sending those dragons not hit from their perches as they detached themselves and took wing like great bats darting around the cave. Across the lake, Dean watched the chaos unfold as he crouched behind a stalagmite. Moments before he had all but given in to fear and doubt at the sight of the dragon's young lining the ceiling like some dark army out of the Abyss, but upon hearing the victorious cries of his kinsman at the death of the male Echowyrm Dean's vigor was renewed and he rose from his hiding place to a half crouch, knocking an arrow in his longbow. One of the Rangers unwilling to make the transition to crossbows, Dean swore by the bow he had trusted since his youth and as such was chosen as one of two Rangers charged with an important task: to circle the lake in secrecy and set up positions so that they might open fire on any young that attempted to flee to deeper parts of the cave. Signaling Ronald, son of Roald - the other Ranger chosen for the task - with a quick whistle, Dean stood and opened fire on the beasts that had only moments before given him such fear. "I am a Knight, and I will fear no more." Some hours later, the Commander of the Valeguard walked with care through one of the many tunnels that branched off of the lake and twisted through the heart of the mountain, a torch in his hand held aloft to light the way. Half a dozen men followed behind - some bearing torches, others bearing crossbows - in one of a few search parties that the Rangers had split up into. 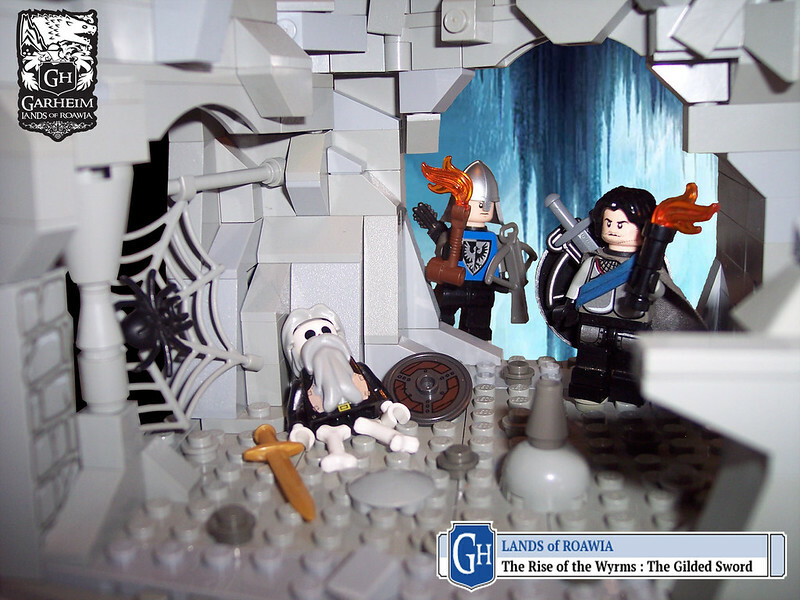 Many of the dragon's young had been felled by the Valeguard along the edge of the lake, but many others had escaped even the vigilant eyes of Dean and Ronald - the two young Rangers the Commander had chosen to pick off any stragglers that attempted to flee - and slithered or flew into the shadowed corners and dark crevices that the cave boasted. "How many?" Caedric Moore asked, shining the light of the torch he held aloft this way and that and throwing long twisted shadows against the walls of the cave. "I can't say with any certainty, my lord, but I'd wager twenty - maybe thirty - escaped the cavern," Dean answered, looking this way and that as he followed the Commander through the winding tunnels. "I know it's a difficult decision ahead of you, sir - leaving any of these monsters alive could come to trouble in the future - but we don't have the provisions to stay here any longer. A day, perhaps - two, if we're lucky." "Less than," answered a deep voice behind the two as Sir Layton Connors - Cedric's shieldman and second in command - rounded the corner and came into view, dark blood still glistening on his dented armor. "Much of what we had has been eaten already, and with the wounded in tow the journey back down the mountain will take at least a day and a half. Our provisions will barely last us that." The big knight set his spear against the cavern wall, running his hands through his prodigious mustache before wringing them together characteristically. "If we're lucky," he parroted with a morbid smirk. "It seems I am outnumbered," Caedric sighed, coming to a halt and turning to his men, "but I suppose you are right. It would be best if we tended to the wounded and set out at dawn's first light." With that, Caedric made to head back the way they'd came but was stopped as a slight - but audible - gasp escaped from his shieldman's lips. Turning once more to see what had caught his attention, Caedric shone the light of his torch over the room as his eyes came to rest upon the desiccated body of an ancient Garhim slumped against the wall of the cave. The Garhim - or what remained of him - was garbed in armor that was rusted by time, the cloth beneath it ragged and thread-bare. Its skin was grey and clung to its bones tightly, while empty eye sockets stared back at the party. At its side rested a round wooden shield that was all but rotted away, but upon its other side lay a sword that glinted and glimmered in the torchlight. Caedric made to reach out and grab the weapon, but a firm hand upon his shoulder stopped him. "No," Sir Connors replied in a serious tone, his usual mirth having left him completely. "You mustn't disturb them - our ancestors - or they may rise and take vengeance. Dragons are one thing, my liege, but the dead are something with which I do not meddle. We must not wake the Draugr." Caedric had heard of Draugr before - one of the maids who worked in the kitchens at Castle Moore often spoke of the legends of Garheim - but he chalked it up to nothing more than superstition. If he could slay a dragon, he could slay the dead. "Still," Caedric thought as he bent down and lifted the sword from its resting place, admiring the golden sheen it had in the torchlight and the ancient runes that ran along its length, "I would not envy the way this Garhim died - lost, alone, and in the dark." Motioning for the party to head back the way they came, Caedric patted his shieldman on the shoulder good-naturedly and flashed him a smile, ushering him back and away from the ancient Garhim and towards the dark lake and the rest of the Rangers. The longboat creaked and groaned as it rocked gently on the waves lapping against the thick wooden pilings of the dock, blue-clad soldiers here and there tying her mooring ropes to the bollards and lowering gangplanks to the pier below. The Dragon's Blood, a wooden longboat built in traditional Garhim fashion and given to Caedric Moore by his wife's uncle, had proven more than sea-worthy, bearing the Commander of the Valeguard and his men from the shores of Black Loch north to Jharton Bay and down the mighty Havenhill River to Lake Mikithdar. Built on the vast deep lake, the capital of Garheim was much larger than many others cities in the north, dwarfing all of Orevale Hold, and the docks were packed with boats and ships of all sizes coming and going, their hulls laden with fish, furs, lumber, stone, and steel, along with spices and other commodities not native to Garheim. Caedric watched his soldiers absentmindedly as they unloaded their cargo, men and women of Orevale alike with the sigil of the Valeguard emblazoned on their blue tunics: a silver owl and an onyx falcon, half of each meeting the other on a black and white field. Gulls cried overhead, floating lazily on the cool breeze as thick snowflakes fell slowly and steadily from a sky the color of burnished steel to land softly on the thin layer that already blanketed the roofs of the houses lining the waters' edge. "The Jarl, my lord," a voice sounded to his left, snapping him from his reverie. Turning, he noticed his shieldman Sir Layton Connors, grey mustache blowing in the salt breeze, and followed his gaze to the house closest to them as the Jarl of Garheim approached, flanked by two soldiers wearing the purple cloaks of the town guard of Mikithdar. Caedric had only once met Jhirian Eindrik before as he passed through Orevale, though he had been very young and he doubted their meeting had left much of an impression. The Jarl, however, was full of surprises, greeting Caedric as an old friend might. "Caedric, my lad," Jhirian smiled, removing his winged helmet and handing it to one of the guards before firmly grasping Caedric's hand and shaking it vigorously. "Caedric Moore, the dragon slayer. Welcome to Mikithdar." "It is a pleasure, Jarl Eindrik." "Bah, nonsense. Call me Jhirian. Now, where is this dragon of yours? And don't point to your ship, now, fearsome as she is." Caedric stepped back as two of his men brought forth their grisly cargo: the skull of the male Echowyrm, the female's having already been mounted in the great hall of Ulchabhan Castle. The Jarl was visibly impressed, taking great interest in the shape of the dragon's horns and the number of teeth it had possessed in life, and if the smirk he gave when Caedric showed him the sword he'd found was any indication, Caedric knew he had stumbled upon something rarely seen. "This dragon will look great above my mantle," Jhirian grinned, clapping Caedric on the shoulder before handing him back the sword he had found. "But I have no need for a dingy old blade such as this," he said with a wink from his one eye. "I'll have my men reforge it before you leave and you may keep it as a token of my gratitude." "You're welcome, Laddie. Come. Let us make for my dining hall; there is a feast laid out for us in your honor." As usual, comments and criticism are welcome and appreciated!